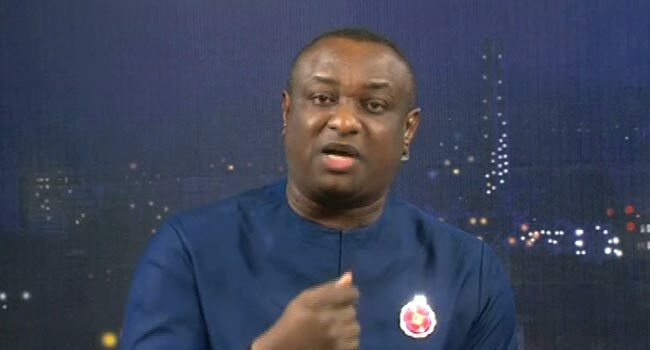 (File) Festus Keyamo speaks during his appearance on Sunday Politics on December 9, 2018. A lawyer, Mr Festus Keyamo, has criticised the Peoples Democratic Party (PDP) for asking Mrs Amina Zakari to recuse herself from her appointment as the chairperson of the Collation Centre Committee for the general elections. Reacting to the controversy trailing the appointment of the national commissioner by the Independent National Electoral Commission (INEC), he condemned the allegations of impartiality by the opposition party. “We are stakeholders too, PDP has no right to impose on the nation what its own sense of fairness is,” said the spokesman for the Buhari Presidential Campaign Council during his appearance on Sunday Politics. Keyamo also faulted the insinuations that the reactions of the All Progressives Congress (APC) were attempts to defend the electoral umpire. He insisted that the ruling party was in support of credible elections and the Federal Government would ensure a free and fair process as promised by President Muhammadu Buhari. “We are not here, and let us make it very clear, to defend the position of INEC because INEC is there to also defend themselves,” the APC member explained. Keyamo further described the controversy over Zakari’s appointment as “a storm in a teacup”, noting that it was unnecessary. He, however, accused the PDP of repeating lies “in one million times” in order to force such on Nigerians ahead of the polls. The lawyer questioned why the opposition party was insisting that President Buhari and Mrs Zakari were related by blood, even after the Presidency had explained the relationship between them. “They have explained the relationship that does not fall within any of the definition of relatives,” Keyamo added.